Tete Montoliu (1933-1997) was a bebop-oriented pianist from Barcelona whose influences included Bud Powell, Al Haig, Lennie Tristano, Oscar Peterson and Wynton Kelly as well as Art Tatum and Bill Evans. He began to be recognized outside of Spain in the late 1950s, and eventually became one of the most celebrated jazz pianists in Europe. 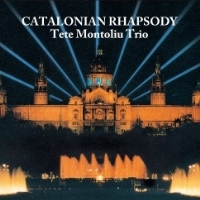 Catalonian Rhapsody is a very special album Tete recorded in his late period. This recording, which took place in Barcelona in 1992, captured Tete playing traditional Catalonian melodies in a trio setting, supported by bassist Hein Van de Geyn and drummer Idris Muhammad. This great album is now remastered by Venus Records and presented to us jazz fans with superb sound quality! Recorded at Albert Moraleda Studio in Barcelona, Spain on March 8, 1992.